We all want our homes to sparkle. With most modern siding surfaces today it is important to clean them at least once a year to keep elements such as dirt, smoke, dust, wind, and rain from causing a rough, dreary appearance. A yearly house wash will also help your paint job last much longer. Pressure washers are also used to prepare your house for repainting. 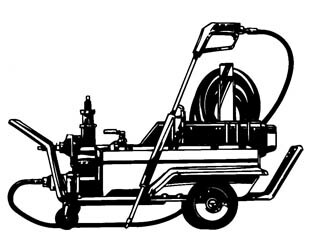 There are various types of pressure washers available. We will help you select the right equipment for your job. Always keep fingers away from the spray tip. Keep children and animals away from the entire area. Wash from the bottom up and rinse from the top down. This avoids streaking. Be sure all windows are tightly closed, cover outside light fixtures and electrical outlets with plastic and use masking tape over flush receptacles. Eaves and crawl spaces sometimes have vent openings. Be careful to avoid spraying into them when washing or rinsing. Soft water will give the best results. In hard water areas, wipe windows with a soft cloth to prevent spotting. When preparing for repainting, use the pressure to get rid of all loose, cracked and blistered paint. Scrape and sand areas where paint has come off and where paint has blisterd. Edges should be sanded and smoothed out. Remove all loose putty around windows. Large areas of peeling or blistering can mean moisture presence. You may want to install some air vents in the siding, or wedges under some of the clapboards. Spot prime any bare wood areas and when primer has dried, any needed puttying can be redone and loose joints caulked to prevent water entry. Once you have washed your house, use the pressure washer to clean your driveway, trash cans and garden tools. It's easy with the right rental equipment and instructions from your professional rental centre.